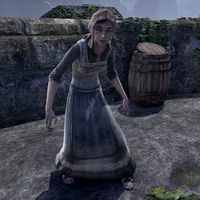 Reynine Marose is a Breton refugee found with her son Jonah at the Southgard Tower. After the bloodfiend attack on the settlement of Crestshade, she was driven to paranoia. Although her son insists she is fine, she does not form coherent sentences. "My son... good son ...."
All of these lines hint at her condition. Afterwards, you meet her and Jonah outside Shadowfate Cavern, where she is feasting on a giant bat.